President Trump promised a “major announcement” during yesterday’s remarks summing-up his trip to Asia, and when his remarks concluded the establishment media was quick to complain that there was no news in the speech. Presumably they were angered that Trump didn’t join the mob and throw Judge Roy Moore under the bus, nor did he take any questions that would allow them to harangue him about the fake news du jour, so to them the most important thing that happened during the remarks was that he took a sip from a water bottle. Can anyone reading this imagine Edward R. Murrow or Walter Cronkite destroying their credibility and dignity by reporting as “news” the fact that the President took a sip from a water bottle during a speech? So here is some the real news the President made in his remarks and during his trip to Asia. With China, trade and investment deals potentially worth $250 billion were announced that will create jobs for American workers, increase United States exports to China, and stimulate investment in American communities. With South Korean companies, the President announced 64 new projects that will invest more than $17 billion in the United States over the next four years, as well as plans to purchase $58 billion in United States goods and services, including $23 billion in energy purchases. The President also announced that the United States and Vietnam have concluded $12 billion in commercial agreements, which when implemented will include $10 billion in United States content. Here’s the news content in that “major announcement.” Unlike Obama, whose trade policies exported American jobs, not American goods, President Trump is conducting himself as the salesman in chief for American jobs and American products. Trump’s policies are a stark change from previous administrations where negotiating trade deals was an end in itself – regardless of the effect on American workers. Another “major announcement” in the President’s remarks was what one might call the “Trump Doctrine” on trade. 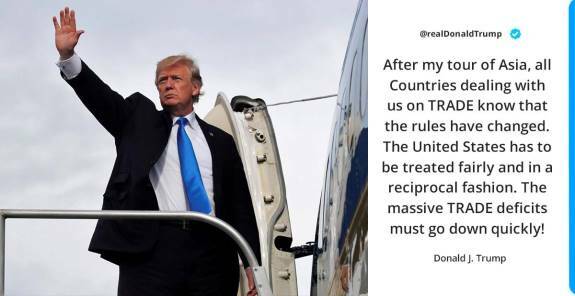 The President made it clear he has all but abandoned the globalist policy of “free trade” and instead will pursue “fair trade” between the United States and its partners in Asia. The Trump administration will work to end years of one-sided and unbalanced trade that has left too many Americans behind. Regarding Japan, President Trump delivered clear messages on the need for balanced trade and greater market access commitments, and Japan committed to improving trade in the areas of motor vehicles and life sciences innovation. President Trump said Korea committed to quickly renegotiate the U.S.-Republic of Korea Free Trade Agreement (KORUS) and to reduce the United States’ trade deficit with the Republic of Korea and achieve balanced and reciprocal trade between the two countries. Regarding China, President Trump underscored the importance of rebalancing the bilateral economic relationship and his commitment to press the Chinese to reduce the trade deficit by eliminating barriers to trade, guaranteeing fair and reciprocal treatment to United States companies and exports, implementing market-oriented reforms, and eliminating forced intellectual property transfer and theft. President Trump said he and Vietnamese leaders pledged to deepen and expand bilateral trade and investment relations, in line with the President’s commitment to pursuing fair and reciprocal trade with key trading partners. And that’s just the news on the economic front. The news that the establishment media doesn’t want to cover about President Trump’s trip to Asia is that Trump just executed the “pivot to Asia” that Obama promised, but never delivered. What’s more, he did it by rejecting the job-killing Trans Pacific Partnership and working to export American products, not American jobs. Submitted by email_registrat... on Thu, 11/16/2017 - 18:31. Everett Dirksen, once a Congressman from Illinois, famously said something like, "a million here, a million there, soon we're talking about real money." President Trump reported on agreements worth from 10 to 250 billion dollars each and the news media doesn't consider that to be any big deal? What would he have to announce, to satisfy the media, that qualifies as a "major" announcement? SMH.